An awesome science & arts series on everything from Black Holes & Dinosaurs to Human Evolution & the Brain. Just bring your smart self! 205 backers pledged $11,020 to help bring this project to life. Help us make “Secret Science Club: Season Five” (Sept 2011-Aug 2012) our most creative and mind-blowing season EVER. 1. What is the Secret Science Club? The Secret Science Club is a science lecture, arts, and performance series based in Brooklyn—and we are about to celebrate our 5th anniversary! We host live science events for the public, featuring subjects ranging from Black Holes and Dinosaurs to Human Evolution and the Human Brain. Every month, leading scientists give amazing talks on discoveries in their fields and unleash their research on an inquisitive audience. Music and film are mixed in with the science, and 90 percent of our events are FREE or low-cost to the public. 2. What is our purpose? And it’s working! 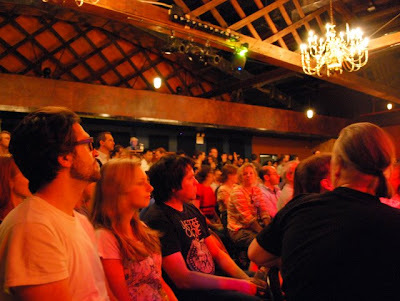 Since 2009 when we officially moved to our awesome new venue, the Bell House, our science-loving events have been jammed with standing-room-only crowds of 300 to 400 people. The Secret Science Club has become part of the New York cultural scene. We’re frequently covered in the media, and SSC events generate buzz and excitement about inquiry, experimentation, and the scientific method. As we near our 5th anniversary, help the Secret Science Club keep going! Help us do even more! 4. Who spoke or performed at the Secret Science Club in past seasons? Since the Secret Science Club debuted in 2006, guest lecturers have included physicists, neuroscientists, biologists, botanists, mathematicians, chemists, geoscientists, paleontologists, and even Nobel Prize winners. We've had astrophysicist Neil deGrasse Tyson on the cosmos, paleoanthropologist Donald Johanson on Lucy and human evolution, James Hansen of NASA on climate change, and Nobel Prize winner Eric Kandel on memory and the brain. We've had scientists from Columbia, MIT, Yale, the American Museum of Natural History, CUNY, Princeton, Cold Spring Harbor Lab, Stony Brook, Brown, Rockefeller, Rutgers, the Brooklyn Botanic Garden, the Institute for Ecosystem Studies, and NYU. We've also teamed up with cultural institutions like the New York City Opera, L Magazine, the Brooklyn Philharmonic, the Imagine Science Film Festival, and the Criterion Collection to bring music, cinema, and science under the same roof. 5. What are people saying about the Secret Science Club? 6. How Does Kickstarter Work? Our goal with our Kickstarter campaign is to raise a minimum of $9,975. But here's the "kick:" If our supporters pledge a total of less than that, the Secret Science Club gets zero. That means all of you who pledge will not be charged and will not get any goodies. Sadness! But we know you won’t let that happen. Just make a pledge for some of the cool stuff we’re offering . . . and tell all your friends about our Kickstarter Campaign. 7. Just Bring Your Smart Self! At the Secret Science Club, we are serious and passionate about bringing science to the masses, and we believe in feeding the public’s desire for an engaged, intellectual life. If you haven't yet experienced the Secret Science Club, we invite you to come check it out! A limited-edition Secret Science Club T-shirt with our cephalopodic logo! (For those of you who need nothing but an all-seeing, many-tentacled graphic to wear proudly on your chests . . . ) Add $5 for shipping outside the U.S.
A limited-edition Secret Science Club T-shirt! Plus, 2 VIP tickets to an SSC screening, the science-themed CD, the membership card, and an amazing science fact on a hand-designed SSC postcard. Add $5 for shipping outside the U.S.
Four VIP tickets to an upcoming Secret Science Cinema screening, lecture, and party, PLUS four free drinks from the bar. Plus, all the above. Add $5 for shipping outside the U.S.
SUPERNOVA LEVEL. A cool commemorative plaque personalized with YOUR NAME certifying that you are officially a Secret Science Club superstar! Plus all the above. Add $15 for shipping outside the U.S.